Tamika is using Smore newsletters to spread the word online. Rosa Parks was born in Tuskegee, Alabama, February 4, 1913. She is famous today for her civil rights activism, but mostly for being the black woman who refused to give up her seat on a city bus. before becoming involved with NAACP (National Association for the Advancement of Colored People) Rosa Louise McCaulley Parks worked as a seamstress but later got fired because of the Montgomery Bus Boycott incident. Her Father (James McCaulley) worked as a carpenter and her Mother (Leona Edwards) worked as a teacher. Her parent's split up when she was only two years old and she then went to live on her grandparents' farm with her mother and younger brother, Sylvester. What did she believe in?? 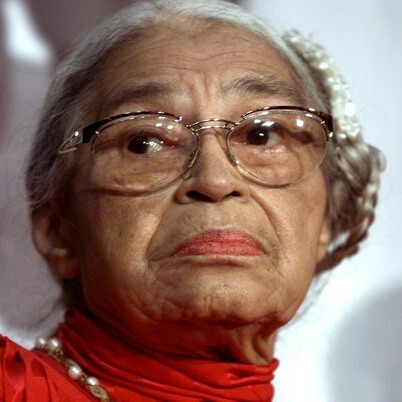 Rosa Parks fought for what she believed in. She and her husband Raymond Parks, whom she married in 1932, were a part of NAACP. Their mission is to ensure the political, educational, social and economic equality of rights of all persons and to eliminate racial hatred. Rosa knew that there was no diffrence between black and white people she also believed that they should be treated with the same respect. Rosa did not like the way that socitey had labeled dark people or as they were known 'dirty' people and after the Montgomery Bus Boycott incident, she decided that she had had enough. How did she fight for what she believed in? One meathod Rosa used to fight for what she believed in was resistance. Rosa resisted giving up her seat for a white person because she believed that was wrong and that white's and black's should be treated equally. This worked because she started a year long bus-boycott and became the symbol of mass movement against racism. 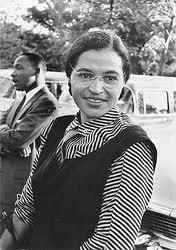 I think Rosa Parks couldnt have done any better in fighting for what she believed in. She stood by what was right and fought for black people everywhere. In my opinion, i think that Rosa's meathod did work and that if not for her racial discrimination would be much stronger than it is now.